Leema Acoustics launches new Elements preamp | What Hi-Fi? 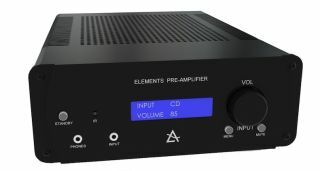 The Elements preamp has the same half-width chassis as the other components in the series and there's also the option of 160-watt bridgeable power amp as a potential upgrade further down the line. Key connections include five, hi-res-supporting (24-bit/192kHz) digital inputs: one coaxial, three optical and one asynchronous USB. Analogue inputs and outputs are a mixture of XLRs and standard phono sockets. You’re also given a high-quality headphone amplifier for personal listening sessions. The new pre-amplifier also features Leema's LIPS tech, which allows you to integrate compatible Leema products and home automation systems. The unit also comes supplied with a remote control as standard. The Elements range has faired well in recent times, so we have high hopes for the preamplifier which is available now, in black or silver, for £1395.